The Last Supper, a monumental wood panel painting by 16th century artist and pioneer art historian Giorgio Vasari, spent more than 12 hours under water during the flood that submerged Florence on November 4th, 1966. On display at the Museo dell’ Opera in the lower levels of the basilica of Santa Croce, the 21-by-8-feet Renaissance masterpiece was too huge to move and because the church and monastery are in the natural basin at a lower elevation of much of the rest of the city, the water rushed in just after daybreak before anyone realized Florence was in the grips of a cataclysm. By the next morning, the waters had receded but what was left behind was even worse: a thick, sticky sludge of mud, diesel oil, gasoline, sewage and naphtha released from underground home fuel tanks. Naphtha is highly flammable with a low flash point — people feared with good reason that the already-devastated city would go up in flames to boot — and it’s an industrial solvent. 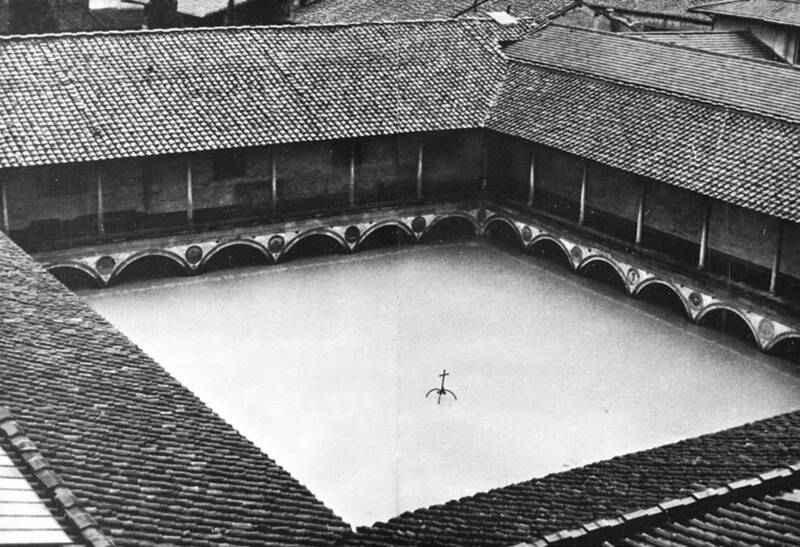 Florence’s inestimable cultural patrimony was first struck by a gritty mixture of water, sewage and naphtha going 40 miles an hour at peak intensity and then soaked in that mixture for at least a day. Volunteers, first from Florence and environs, then from the rest of Italy, then from elsewhere in Europe and the world, dug through the knee-deep muck to recover artworks and books, sifting through it to collect tiny fragments of paint stripped from some of the greatest works of Western art. They were dubbed Angels of the Mud and without their efforts, Florence would have lost many more than the 14,000 works of art and literature that were destroyed in the flood. The Last Supper was hard hit by the water and mire. The poplar wood panels were the texture of a wet sponge. The layer of gesso on top of the wood and underneath the paint was so sodden it began to sag off the panels taking the paint with it. 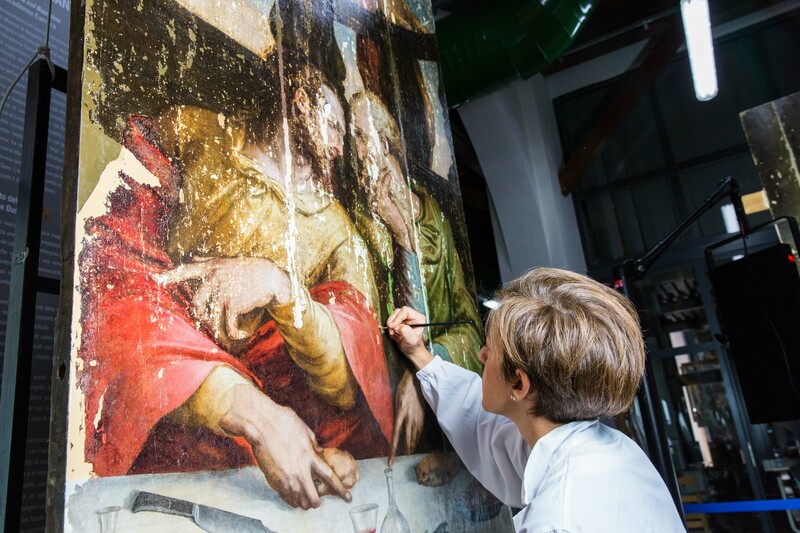 Its rescuers realized they had to keep as much of the paint adhered to the surface as they could while drying the piece slowly enough to minimize cracking and warping, but quickly enough to keep the wood intact. They covered the entire surface with rice paper squares to stop the paint from falling off and separated the five panels for faster and more thorough drying. Their quick action saved the painting from destruction, but restoration was out of the question. The damage was too extensive to be repaired with the techniques of 1966. So the Last Supper was put in climate-controlled storage until such time as humanity was sufficiently advanced to revive it. 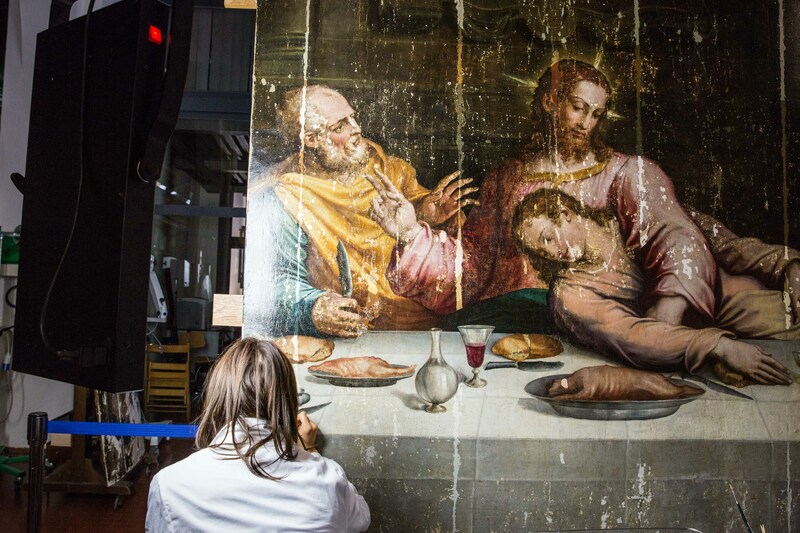 That time came 44 years later, when, funded by a $400,000 grant from the Getty Foundation, Florence’s Opificio delle Pietre Dure began restoring the monumental work. 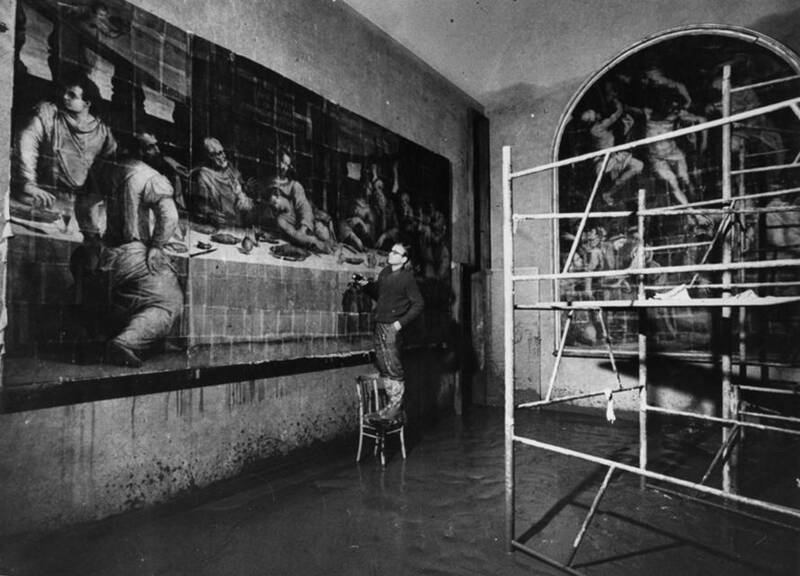 It was a wheel-has-come-full-circle moment because the Opificio, founded in 1588 by Ferdinando I de’ Medici to produce intricate inlaid stone mosaics, changed its focus to art restoration in the wake of the 1966 flood. Now it is one of the top restoration institutes in the world. In 2013, The Last Supper was put back together again for the first time in 47 years. Restorers also removed the rice paper and cleaned the flood filth still imbued in the paint and gesso. Since then, I’ve looked for updates regularly, anxious for the final before-and-after reveal. It’s not here yet. The Opificio has been very reticent to put an end date on the project because it’s so complicated they don’t want their PR to write checks their begloved hands can’t cash. They’re hoping it can be complete by November of 2016, in time for the 50th anniversary of the flood. Last year fashion house Prada donated an undisclosed amount of money to help with the final phase of restoration. That made the news, but it didn’t quench my thirst for the after pictures. An update from a few weeks ago, however, provides a tantalizing glimpse into the restoration process. PBS NewsHour covered the story as part of its Culture at Risk series and it’s awesome. The paint is looking damn good. Now I’m even more anxious for the final before-and-after. This entry was posted on Wednesday, December 9th, 2015 at 12:37 AM	and is filed under Modern(ish), Renaissance. You can follow any responses to this entry through the RSS 2.0 feed. You can skip to the end and leave a response. Pinging is currently not allowed. I am also highyly anticipating the restoration results. As a teen when this flood happened, it has taken a very long to achieve this ‘final goal.’ I am pleased several organizations have joined skills and finances to support this work. 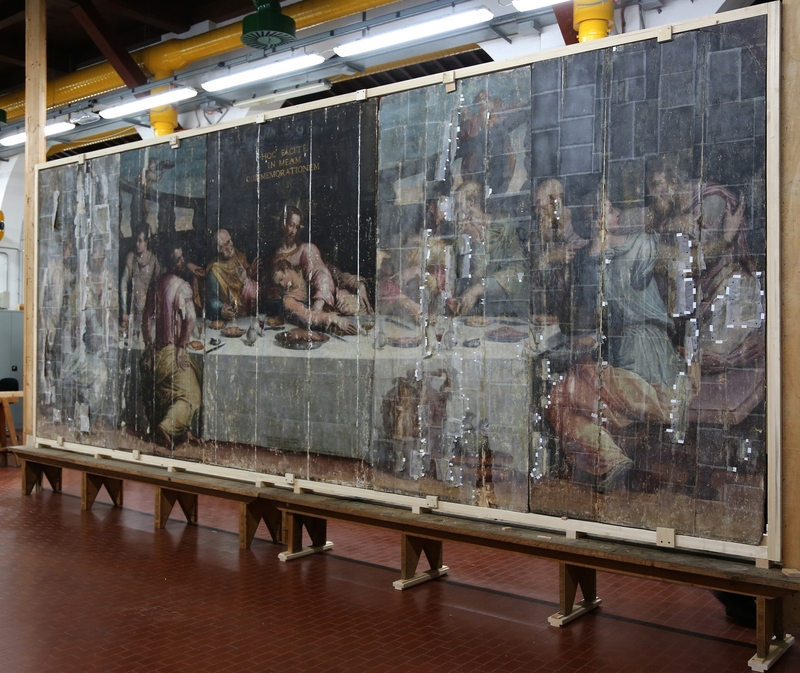 About 25 years ago, I donated funds for the purchase of special air conditioners for De Vinci ‘THE LAST SUPPER.’ (Humidity was destroying the beloved treasure.) There is a new, large format book by Haltadefinizione / White Star Publishers reveals their high technology techniques in saving the icon. 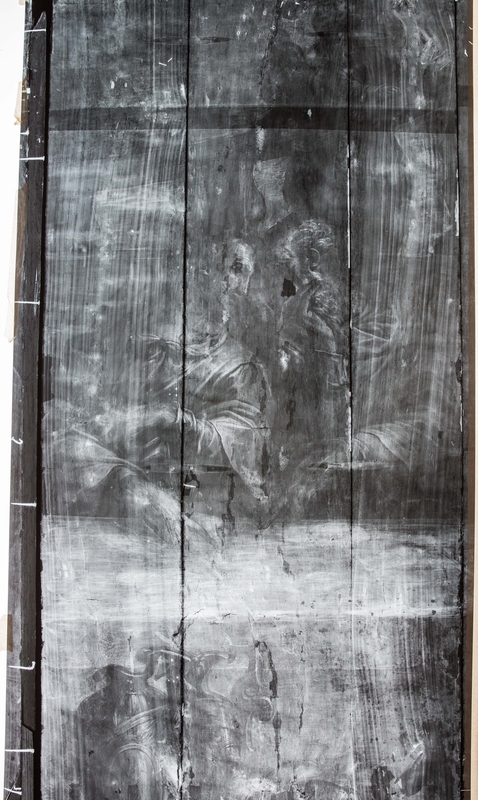 I would hope THIS EFFORT with Vasari’s artwork will be presented likewise in another edition! Curious that the team appears to be handling the panels with bare hands. I have never seen a version of THE LAST SUPPER where Christ is “holding” someone. Who was (is) it & why the marked change from Michelangelo?? That is St. John, the youngest disciple, peacefully sleeping in Jesus’ arms while all around him the other disciples freak out. Jesus holding the sleeping John was a popular iconographic motif in 15th and 16th century representations of the Last Supper. See for instance Andrea del Castagno’s 1450 mural at Sant’Apollonia in Florence, and Ghirlandaio’s from 1480, likely inspired by Castagno’s, in the Convent of the Ognissanti also in Florence. Leonardo took a different approach, as was his wont, but even in his Last Supper John is depicted with his eyes almost closed and leaning to one side (away from Christ) as if he’s about to faint.